In statistics, a fundamental concept found in the introduction to probability. 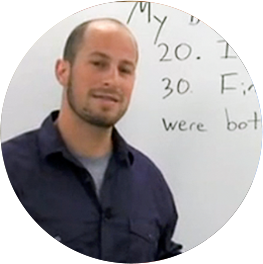 When dealing with the introduction to probability, students first encounter basic problems that calculate the likelihood of an event occurring, an event such as drawing a specific card from a deck. 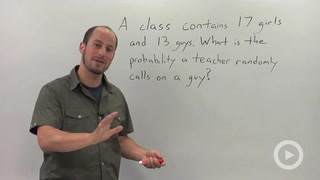 Terms from an introduction to probability include an event, its complement and the sample space. We're now going to start talking about probability and probability is something that comes up a lot in life, okay. So in general in Math equations what we are actually going to be talking about is sort of picking up cards, or rolling of dice, or choosing of balls or something like that. But really in real life what actually happens is probability is pretty much the same thing as the odds or the chances. So in you know in sports, batting average is a sign of probability, okay? What you end up doing is taking the number of times a batter gets a hit over the number of times the batter's bat and that gives you your batting average. That is a probability. So sort of by looking at it you can say okay, what are the odds of them getting a hit each time they're up. So before we dump into this we need to get some language, okay? The first thing I want to talk about is the sample space and the sample space is just basically all possible outcomes that are in our situation. So with that baseball player, them going up to bat is a part of the sample space and each time they go up that adds to that sample space. Event is the results that you are concerned with, okay? For batting average that's getting them a hit. Whether it be a single, a double, a triple whatever it is, it's a single event that is helping you in your sort of quest for this probability. And how probability is calculated and probability is always going to be between 0 and 1. Something is either going to never happen or always happen and it's really going to be anywhere in there. You're never going to have a negative probabilty, you're never going to have a probability bigger than 1. And what you're really concerned with is the number of events that you are concerned with. So that baseball on the number of hits over the number in the sample space. And this one it was not example it's the times of bat, okay? And that's really all that probability is, it's just ratio and it gets significantly more complicated but really when push comes to shove it's always going to come down to the number of events over the number of possible outcomes. Okay, so let's just do a very basic problem and what we're going to look at is a rolling of a dice, okay. You roll a die, you have 6 sides. So really your sample space, your entire result is going to consist of the number 1, 2, 3, 4, 5, or 6 okay? And the event you're concerned with is just rolling the single number that you want. Okay. In this case we just want the number 4. So for the number 4 is really the only event we're concerned with. So to find the probability it's a number of events, in this case just 1 over the number in the sample space, in this case 6. Okay? So the probability of rolling a 4 is just 1 out of 6. We didn't need this language in order to calculate that obviously but when we get to harder problems, it's pretty much the exact same set up and it can come back to number of events over the number in the sample space.